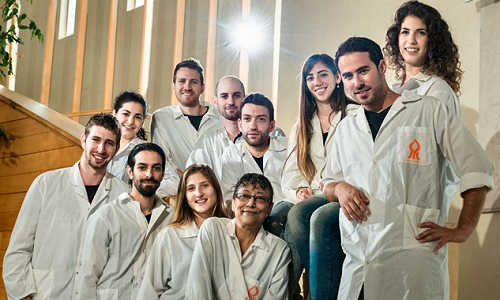 Ten BGU undergraduate students will represent Israel in the prestigiousiGEM (International Genetically Engineered Machine) competition for genetic engineering at MIT where they will compete against 250 other student teams from the top universities worldwide. The competition will be held November 1 – November 3, 2014 in Boston, MA. The team, under the supervision of Prof. Smadar Cohen from the Avram and Stella Goldstein-Goren Department of Biotechnology Engineering is developing an innovative customized treatment for metabolic syndrome. The syndrome is diagnosed in one out of four people in the world’s population and includes symptoms such as diabetes and obesity, which are a significant catalyst for life-threatening heart disease. Today, most of the traditional drugs against the syndrome cause unwanted side effects and only treat the symptoms. The team is working on developing “smart” drugs that are able to respond to body signals post injection and transform their operations in real time. These methods are expected to reduce side effects and improve the efficacy of treatment significantly. The treatment is carried out using biological and engineering methods that are at the forefront of cutting-edge science and are based on personalized treatment. The team’s vision is to create a world in which synthetic biology and genetic engineering will be an integral part of medical treatment for everyone and their project is only the beginning of fulfilling their vision. The team is also working hard on integrating a healthy lifestyle (sports nutrition) and science in order to create a global awareness with an emphasis on technology and innovative research. To that end, the team organized a special medical experts panel to present their project and cutting edge biological research. The well-known speakers came from various backgrounds such as: Diabetes specialists, personal-medicine physicians, nutritionists and more. The panel took place during the largest entrepreneurial conference in Israel, Innovation 2014, which drew over two thousand high-tech personnel, entrepreneurs, CEOs and other public figures. This past Friday, the team organized a seminar day for 50 Bedouin students in medical professions, so they can become “Diabetes Ambassadors” to their communities. The event was sponsored by the Bengis Center for Entrepreneurship and Hi-Tech Management and in full collaboration with Dr. Yunis Abu-Rabia, a senior physician at Soroka University Medical Center who is an expert on Diabetes and was the first Bedouin doctor in the Negev. They are planning on organizing additional educational activities on synthetic biology and healthy living for the community. The project is supported by the President of BGU, Prof. Rivka Carmi, The Rector of the University, Prof. Zvi HaCohen, Deans of the relevant Faculties, The Ministry of Science and Technology, The Ministry of Health and many companies. The previous team from BGU (2013-iGEM BGU) that developed a “self-destruct” mechanism for bacteria was the first team from Israel to reach the world championships at MIT and won several awards such as silver medal, best presentation and more. They were even endorsed by Prime Minister Benjamin Netanyahu. This year, members of the BGU 2014 iGEM team are determined to reach first place, to bring honor to Israel and Ben-Gurion University, but more importantly, to help millions of patients around the world to improve their health and quality of life. Western modern lifestyle brought us a lot of wonderful innovations, but also many problems. Today, about 40% of the western world population suffers from The Metabolic Syndrome. This syndrome is a cluster of medical conditions, including: abdominal obesity, elevated blood pressure, Insulin resistance, high blood triglycerides and more. These medical conditions are interconnected and are a result of complex metabolic pathways, meaning most traditional drugs used to treat them have undesired side effects. Additionally, many of the symptoms have varying genetic causes in different people, requiring a more personalized approach. In this year’s project we intend to utilize the emerging field of synthetic biology in order to develop novel strategies for the treatment of metabolic syndrome. Our vision is creating a personalized treatment – minimizing the side effects while maximizing the therapeutic effect. The project will also encourage people to maintain a healthy lifestyle in creative ways. Prof. Smadar Cohen from the Avram and Stella Goldstein-Goren Department of Biotechnology Engineering, Ben Gurion University, received her BSc, MSc and PhD (Biophysics) from Tel Aviv University, and went on to a postdoctoral fellowship at the Massachusetts Institute of Technology (with Prof. Robert Langer). Prof. Cohen’s research explores several areas in modern biotechnology, from designing of instructive biomaterials for inducing tissue regeneration and tissue engineering ex- and in-vivo to implementation of intelligent delivery systems for therapeutic peptides and proteins. AlgiMatrix– a scaffold for 3-D cell culture – has been developed in her group and has been licensed and developed into a product by Invitrogen Corporation (Carlsbad, California). Prof. Cohen also developed BL-1040, an alginate-based biomaterial for treating acute myocardial infarction (in clinical phase I /II study). 26 Years old, fourth year Biotechnology Engineering student in an excellent PhD program. Originally from the southern city in Israel- Eilat. I have great passion for science since childhood, and I believe that thoroughness leads to successes. 24 years old, second year Biology and Psychology student. I participate in ‘Ashalim’ – which is an excellence program in the Faculty of Natural science. In the army I was a commander of ground radar. I am very curious, love new challenges and have great memory for unimportant facts. 26 years old, fourth year BSc. Physics and BSc. Computer Science student. Served in the IDF as a combat intelligence officer. I have a multidisciplinary passion due to a major interest in many areas in science and technology. I am also interested in music and sports. 22 years old, second year Life Science student. I live in Lehavim, a small town in the north of our beautiful Negev. I served as a flight control simulator instructor in the IDF Air Force. I am a dancer and choreographer and also very curious and like challenges and new experiences. 26 years old, third year Biotechnology Engineering student. I believe that biological machines are the most advanced technology in the world and it should be exploited for human purpose. I like music and play on the piano. 26 years old, third year Biotechnology Engineering student. Today I live in Beer- Sheva, Originally from Ashdod and for that I am in love with the sea. I am also addicted to TV shows, music and have great passion for science. 26 years old, third year Biotechnology Engineering student. In the army I was a Mortars officer in the infantry brigade. I have great ambition and volunteering spirit, and I recently finished a ten year program of developing leadership among youth. 26 years old, third year B.Sc. Information Systems Engineering student. I am a research assistant in my department in the field of artificial intelligence. I love team sport, gadgets, and exploring different cultures. 25 years old, third year Economics and Political Science student. My dream is to found my own Start-Up, until then I am taking part in student’s leadership programs and different initiatives. More than everything I love traveling around the world and meeting new people. 26 years old, second year B.Sc. Industrial Engineering and Management student. I have a special passion for working in a team, and have been fascinated by new technologies ever since I was a child. I love having dreams that seem impossible yet challenge me and I enjoy meeting new friends, hiking, reading and going out.